Half-way down India’s west coast, the small state of Goa is an ideal place for a relaxing beach holiday, inspiring adventure and yoga trips or as the final, stylish leg of a longer South India tour. Adventure tours in Goa can easily be combined with tourist attractions in neighboring Karnataka. 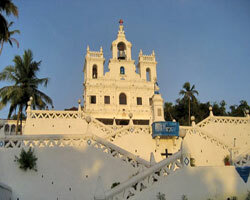 Despite its exotic, tropical character, Goa is much more “European” than any other region in India. This is due to the cultural imprint of 450 years of Portuguese colonial rule, which ended in 1961 but has left its mark everywhere. Grand villas, whitewashed churches, imposing colonial-style buildings, manicured gardens and attractive strip malls are as much a part of its appearance as traditional rice fields, Hindu temples and fishing boats under coconut trees. The outcome is a tolerant culture in which eastern and western lifestyles blend together in a relaxed and natural way. Goa’s atmosphere exudes a very special flair, one that invites you to linger and relax. Goa is especially famous around the world for its beautiful beaches. More than one hundred kilometers of sandy and palm-fringed coastline, occasionally interrupted by cliffs, coves and rivers, promises the perfect bathing fun. Sunlit hours at the beach, evenings illuminated by silvery moonlight and evocative sunsets over the Arabian Sea are among the highlights of a stay in Goa. The best beaches can be found in Benaulim, Cavelossim, Morbor, Palolem and Aguada. Well-known beaches and meeting places are Anjuna, Calangute and Colva. For water sports enthusiasts, the offered activities include scuba diving, snorkeling, water skiing, parasailing, jet skiing, windsurfing, fishing, canoeing or kayaking. Luxurious beach resorts and solid mid-range hotels offer well maintained accommodation close to the beach. All resorts and hotels have their own swimming pools as an alternative to the sea. In the spa areas, one can indulge in Ayurvedic massages. Goa is known for its excellent local, international and Chinese cuisine. At the main beaches, there are many good beach bars and restaurants that serve fresh seafood and other Goan delicacies. Dishes with fish, shrimp, shellfish, crab and lobster are among the specialties of the region. Among the cultural attractions in Old Goa is the Basilica of Bom Jesus, which has held the mortal remains of St. Francis Xavier for almost 400 years. Other places of pilgrimage are the Cathedral of St. Catherine and the St. Francis Church. Several Hindu temples can be found in the area around Ponda in the Goan hinterland, characterized by dense vegetation and attractive hills. Among the most famous shrines are the Sri Mangesh temple in Priol and the Shanta Durga temple in Quela. In the Bondla Wildlife Sanctuary and other nature reserves, one can see sambar deer and other wild animals in their natural environment. Also interesting is a visit to one of the many traditional spice gardens. For shopping, we recommend a shopping trip in the old town centre of Panaji, or a visit to the famous markets of Mapusa and Anjuna, which take place on Fridays and Wednesdays respectively.